Welcome to the first newsletter of Treasure Beach Foundation—we hope to share an occasional glimpse of what we do so you can see the difference your donations make providing opportunities to the people of Treasure Beach, a rural fishing village on Jamaica's southwest coast. Treasure Beach Foundation provides opportunities to the people of Treasure Beach, a rural fishing village on Jamaica's southwest coast. Concentrating on educational needs, we award competitive scholarships to students for their seven years of high school. (One year of public high school for a Treasure Beach student costs roughly $2,000 U.S. per student, meaning about $14,000 to get through high school, a huge obstacle for most families.) 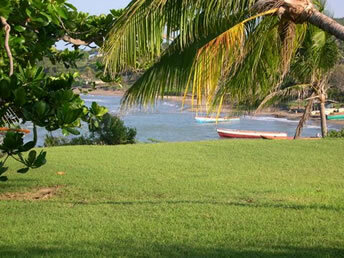 We also provide learning materials for the elementary school and pre-school in Treasure Beach. We assisted the community with materials to repair and rebuild after the major devastation caused by Hurricane Ivan in 2004 and Hurricane Dean in 2007. Our primary sources of fundraising are from proceeds of our annual villa raffle, donations from individuals, and corporate grants. No one on either our Board of Directors or Board of Advisors is paid; all of their work is done on a voluntary basis. Because we are a U.S.-based nonprofit that has achieved 501(c)(3) status, all donations made to us by U.S. residents are deductible to the fullest extent of the law. For more information, please see www.treasurebeachfoundation.org. 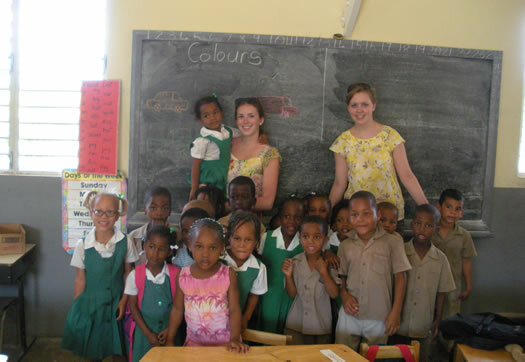 Above: Kathryn Tiller and Maggie Moriaty of U VA with Class 2 at the basic school. "Now that I've known them for another year, it was definitely much harder leaving the kids behind." Would you give up your vacation time to work somewhere else? Thankfully, some generous people do exactly that. This was the sixth consecutive year a group of University of Virginia (U VA) students came to Treasure Beach on what's known as the Alternative Spring Break (ASB) program. Instead of taking their regular spring break, summer, or winter breaks (and relaxing or partying), the ASB volunteers go to different places in the world to be of assistance where they are needed. They all take this assignment very seriously, and they actually have to apply to volunteer. They pay 100% for the cost of their trips—transportation, accommodations, meals, recreation, etc. ; as you can imagine, they scrimp and save for ages to be able to afford helping others. They even hold fundraisers. They solicit donations. They do whatever's necessary to raise the money. Twenty-one enthusiastic University of Virginia students gave up their spring breaks to go to Treasure Beach to assist in both the elementary and pre-school in March. Three of the 21 were in Treasure Beach last year and served as Site Leaders for the 2010 trip; 18 of the students visited Treasure Beach for the first time. "Thanks! The experience was amazing." These unselfish students assisted in all the grades, sometimes on a one-on-one basis and sometimes with groups. In one case, they substituted for a teacher who had to miss school for several days. They did individual tutoring, assisted grade six students prepare for the GSATs, conducted special learning sessions, and helped in any other ways they could. Many of them forged bonds with individual students from Treasure Beach and will continue to be in touch with them, a tradition that has developed and endured over the years. "This made a huge impact on my perspective." Treasure Beach has always been one of the locations most popular with the ASB students because of the very warm welcome they receive from the community and the schools. 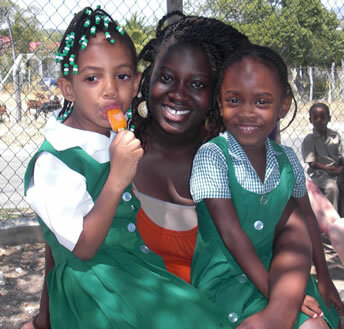 Prior to going to the schools to assist, they enjoyed a big dinner with Miss Zane Ebanks, Principal of Sandy Bank Primary (the elementary school); Mrs. Erna Black-Neil, Principal of Sandy Bank Basic (the pre-school); and 13 of the fine students who have received scholarships from Treasure Beach Foundation. This gave everyone an opportunity to meet and mingle. And it gave the ASB students an opportunity to learn more about the educational system in Treasure Beach, as well as the challenges facing the teachers and students. ASB at U VA has grown to 60 trips a year involving 750 students. Participation says a lot about their character. These trips expose the students to unfamiliar issues and often inspire them to be service leaders in their own communities. Many of the participants end up with a greater commitment to civic volunteering. Some of them told us they changed career paths because of their trip experiences. "I had an awesome time." Even we couldn't ask the U VA students to work round-the-clock. They filled out their non-working hours by walking through Treasure Beach and meeting people, attending houses of worship, going to the beach, taking a sunset cruise on the Shallow Bar, taking a boat trip up the Black River, and lunching at Floyd's Pelican Bar. So, you've been trying to guess which villa is being raffled for the one-week vacation. We bet you're wrong. Be on the lookout for your notice of our 5th annual villa raffle. This year's raffle will be different from any we've held in past years. Newsletter subscribers will automatically receive a raffle flyer but if you know someone who might like to participate and they're not on our mailing list, please ask them to contact us at info@treasurebeachfoundation.org. There are lots of reasons why kids worry. In Jamaica, assuming they plan to continue on to high school (meaning grades 7 through 13), one of their primary concerns is how they'll score on their GSATs. (That's pronounced G-sat and stands for Grade Six Achievement Test.) The GSAT is a very rigorous two-day series of exams in five different subjects—math, science, social studies, language arts, and composition. 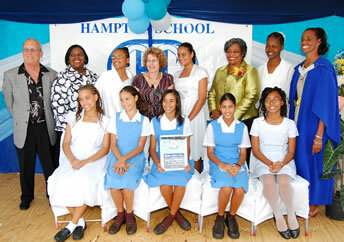 The GSAT results determine which high school accepts them. How are GSAT scores computed? After each of the five exams is graded, each exam score is then further graded on a "curve," with those scoring exactly in the middle getting a 50 (out of a possible 100). The averaged score of the five subjects is what students see as their GSAT result. That one score is used by the Ministry of Education to determine to which high school a student is accepted, though individual test scores are also taken into account—meaning, for instance, a high school with a very demanding science program might not be so keen on accepting a student with a low score in science even if that student's overall GSAT score is excellent. In general, students with the highest overall GSAT scores are accepted into the more competitive high schools—and so forth. Big problems for Treasure Beach kids. An online computer center for Sandy Bank Primary School. We've been getting as many books as possible to the kids in Treasure Beach. But that wasn't enough to help them catch up with their peers from across the country. We went farther. GoGSAT is considered Jamaica's premier GSAT exam preparation website. It has been proven to raise students' scores measurably. Until now, the students from Treasure Beach have been at an unfair advantage competing against all the students who have had regular access to GoGSAT. Those using GoGSAT have unlimited access to timed practice tests. These practice tests are a way of inspiring confidence in the student by building their familiarity with the exams. So we decided to do something about this. The teachers at Sandy Bank gave up their lounge. A volunteer was found to turn this into a real computer center, complete with Internet connectivity and a local area network that will accommodate up to 16 computers. We supplied two excellent laptops to get the lab going. 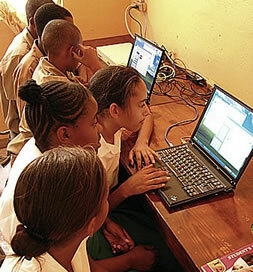 This new computer center is being used as a learning center, featuring the GoGSAT online program—also supplied by Treasure Beach Foundation. We'll be installing GoGSAT software designed specially to meet the varying needs of grade 4, 5, and 6 students. These programs will be in place soon after the school year starts, so the children will be able to make use of them throughout the entire school year. Plus, we've arranged for special discounts (less than half-price) for any families who wish to have a license to use the software in their own homes. Of course, that means they need their own computer and Internet hook-up—but that's another story. We were surprised (and secretly thrilled) to receive special recognition from Hampton School in their recent prize-giving ceremony. The plaque received is for "outstanding philanthropy to Hampton." We now have eight marvelous young ladies on scholarship at Hampton and hope to have even more attending that fine school after we award our next scholarships in June. Make a difference. Make a donation to Treasure Beach Foundation. Above: U VA's Selamawit Hailu reads with Dajay, grade 6, at the primary school. Above: Taylor Richardson makes friends in grade 1 at the primary school. 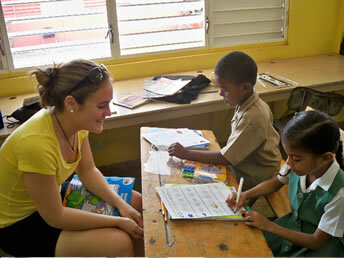 Above: U VA's Jasmine Copeland takes a break with grade 5 students. 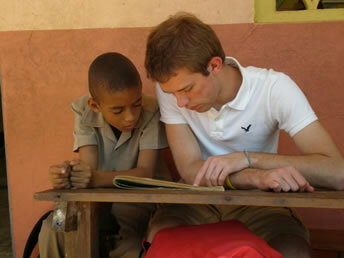 Above: U VA student Robert Kell and a student from the primary school get serious. 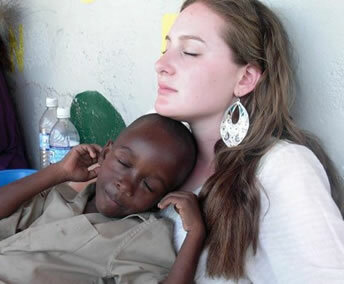 Above: Michelle Ross and 3-year-old Demar share a moment away from books at the basic school. Below: No matter which villa we raffle, the one-week vacation promises to be beautiful! Watch for information about our 5th annual raffle coming soon. 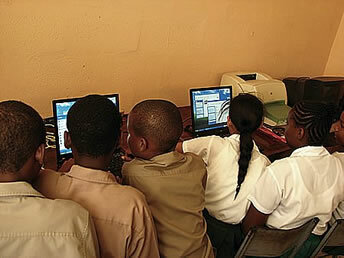 Above and left: Students enjoy Sandy Bank Primary School's new computer center. Do you have a laptop to donate? See below. A new way to help—donate laptops to Sandy Bank Primary School's new computer center. There is a crying need for additional laptops for the Sandy Bank computer learning center. The laptops must be PCs that are in excellent condition. If you are willing to donate one, or if you are willing to donate money toward buying a laptop, you'll know you're helping provide opportunities for these wonderful students. Right now they are all sharing two laptops and are using them on shifts. Yes, U.S. residents may take a tax deduction for donating laptops (or money toward buying one). Even if your donation isn't tax-deductible, the kids will benefit just as much. We ask you to look into your heart and see what you are willing to do to help these students succeed. Pictured at the Spirit of Hampton ceremony, back row, left to right: Peter Kennedy, Director, Treasure Beach Foundation; Donna Parchment-Brown, Chairman, Hampton School Board of Governors; Timara Taylor, grade 9, Hampton School; Karen Kennedy, President, Treasure Beach Foundation; Tajera Vernon, grade 8, Hampton School; Dr. Avis Glaze, President and CEO, Edu-quest International Inc. Canada; Kimberlee Taylor, grade 9, Hampton School; Heather D. Murray, Headmistress, Hampton School. Front row: Samantha Dicker, grade 9, Hampton School; Anath Genus, grade 7, Hampton School; Cydonie Charlton, grade 7, Hampton School; Shakera Smith, grade 7 Hampton School; Mederana Williams, grade 10, Hampton School. Treasure Beach Foundation is a 501(c)(3) organization. To learn more, please visit www.treasurebeachfoundation.org.